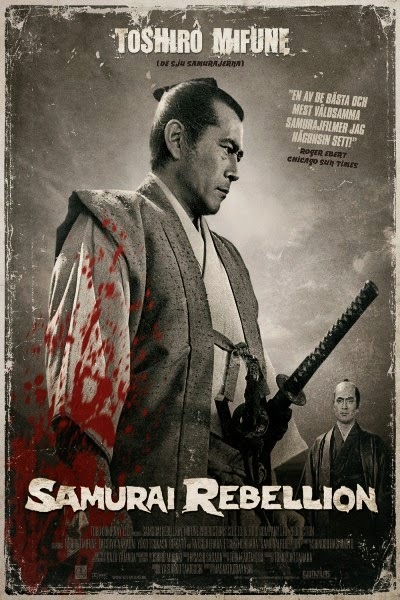 In Samurai Rebellion, Kobayashi provided a bleak examination of the blind obeisance that feudal Japan demanded of its clans, and, in turn, on conformity and subordination being the pillars on which any hierarchical society stands, the degree of inhumanity that the demand for compliance, order and status quo begets, and that revolt being the sole option for those at the receiving end. The film’s anti-authoritarian stance, therefore, was both apt and potent. Isaburo (Toshiro Mifune) is a loyal vassal to his lord and master swordsman whose only equal is his best friend Tatewaki (Tatsuya Nakadai). When his master, upon a humiliating event in public, expresses his desire to get his concubine Ichi (Yoko Tsukasa) married off to Isabura’s elder son Yogoro (Takeshi Kato) despite her already having a child, Isabura grudgingly agrees on account of his loyalty. However, when a couple of years later upon his primary heir’s death, the clan’s lord wants Ichi, who now has a daughter with Yogoro, to come back, Isabura decides that enough is enough. Insolence is an offence that is punishable with death and hence is bad news for not just who has committed it but also for his extended family; consequently his domineering wife, unreliable younger son and others use means ranging from cajoling to cheating to rectify the scenario, while the lord’s henchmen devise means to bring Isabura to his knees; but now that he’s made up his mind, he’s ready for a bloody showdown, including a confrontation with his friend, in his quest for justice. Superb landscape photography, exquisite symmetric compositions and great attention to details powerfully complemented the story’s oppressive ambiance and its innate violence which literally exploded in the climactic fight to death.